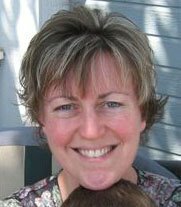 When my daughter and I went to Moab in 2004 to Cunnington Farms to see Sam's (AKA Mary) tunis sheep, little did I know that it was the begining of not just one journey, but two. Turned out that Sam was more than a sheperdess of rare breeds of sheep, she is also a spinner. She was more than happy to bring another unsuspecting dupe into the fold. She gave me half a corriedale fleece; actually, she was giving the fleece to my daughter, who it turns out, had absolutely no interest at all in what a sheep wore, just how it would perform at the 4-H show. So now you know who is responsible for my wool fetish. Sam and I are great friends now and talk often. I don't miss many chances to remind her who's fault it is that I am wallering in wool. 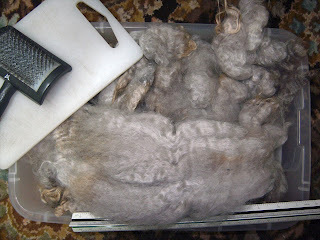 To make a long story short, I decided to find out what I could do with the fleece and I went on line to find out what kind of tools I needed to spin wool. That is what started my love affair with corriedale wool. It should only follow that I would eventually find romney and my love would be divided forever more. Ahh well, the dangers of adiction! So, I have this romney, wonderful crimp, tremendous staple length and ohhhhh so soft! And it has so much grease it is almost impossible to get it out. I have washed this wool I don’t know how many times (really, I lost count). The only thing I can think of, is it sat before I bought it and the grease kind of solidified. ...of course I've had it for over a year... anyway, back to the point! What a great idea on using a cutting board! Thanks for the tip! I have found that Dawn can be too harsh on wool when I scour it. 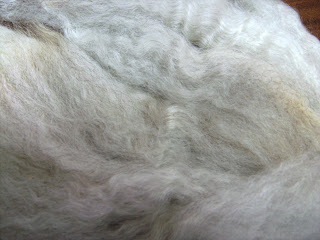 I am trying some "experitments" with different products used for scouring wool. One product you can also use is shampoo...just make sure that whatever you try, don't use too much as it (strong detergents) can make the wools brittle. Dawn has worked great for me, with the exception of a few times when for some reason it didn't want to rinse out. The FiberWash I used is specially formulated for washing wool but it didn't touch the grease in this stuff! Now it's so pretty and clean :)) but it was only with high heat and Dawn. Otherwise my washing machine, fiber bag and dish soap usually do the job. I use a leg cut off a pair of worn-out jeans for flick-carding; that works great for me. I just KNOW the cutting board would be constantly falling off my lap! If you want more Romney, I've heard glowing recommendations about Ace in Hole Romneys; I can get his email contact from the Spinning List if you want it. You should try the cutting board, it doesnt fall off my lap. I tried the jeans thing, but maybe I flick a little harder than I should, I've actually never seen anyone else do it.